Chronic venous insufficiency (CVI) is a medical condition in which the veins cannot pump enough blood back to the heart. The most common cause of CVI is superficial venous reflux which is a treatable condition. As functional venous valves are required to provide for efficient blood return from the lower extremities, this condition typically affects the legs. If the impaired vein function causes significant symptoms, such as swelling and ulcer formation, it is referred to as chronic venous disease. CVI includes varicose veins and superficial venous reflux ("hidden varicose veins") It is sometimes called chronic peripheral venous insufficiency and should not be confused with post-thrombotic syndrome in which the deep veins have been damaged by previous deep vein thrombosis. The prevalence of CVI is far higher in women than in men. The Tampere study, which examined the epidemiology of varicose veins in a large cohort of 3284 men and 3590 women, demonstrated that the prevalence of varicose veins in men and women was 18% and 42%, respectively. The condition has been known since ancient times and Hippocrates used bandaging to treat it. Atrophie blanche. This is an end point of a variety of conditions, appears as atrophic plaques of ivory white skin with telangiectasias. It is a late sequelae of lipodermatosclerosis where the skin has lost its nutrient blood flow. Arteriovenous fistula (an abnormal connection or passageway between an artery and a vein). Tilting the bed so that the feet are above the heart. This may be achieved by using a 20 cm (7-inch) bed wedge or sleeping in a 6 degree Trendelenburg position. Obese or pregnant patients might be advised by their physicians to forgo the tilted bed. ↑ "Chronic Venous Insufficiency". Society for Vascular Surgery. December 1, 2009. ↑ Whiteley MS (2011). 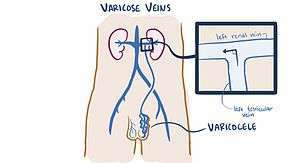 "Understanding Venous Reflux - the cause of varicose veins and venous leg ulcers". Whiteley Publishing. Retrieved January 8, 2015. ↑ RT Eberhardt; JD Raffetto (2005). "Contemporary Reviews in Cardiovascular Medicine - Chronic Venous Insufficiency. Circulation. 2005 111: 2398-2409 doi: 10.1161/01.CIR.0000164199.72440.08". Circulation. Retrieved January 8, 2015. ↑ Evans CJ, Fowkes FG, Ruckley CV, Lee AJ (1999). "Prevalence of varicose veins and chronic venous insufficiency in men and women in the general population: Edinburgh Vein Study.J Epidemiol Community Health. 1999 Mar;53(3):149-53.". J Epidemiol Community Health. Retrieved January 8, 2015. ↑ Robertson LA, Evans CJ, Lee AJ, Allan PL, Ruckley CV, Fowkes FG (May 2014). "Incidence and risk factors for venous reflux in the general population: Edinburgh Vein Study. Eur J Vasc Endovasc Surg. 2014 Aug;48(2):208-14. doi: 10.1016/j.ejvs.2014.05.017. Epub 2014 Jun 18.". Eur J Vasc Endovasc Surg. Retrieved January 8, 2015. 1 2 3 4 5 6 7 8 9 Barron GS, Jacob SE, Kirsner RS (Sep 2007). "Dermatologic complications of chronic venous disease: medical management and beyond". Ann Vasc Surg. 21 (5): 652–62. doi:10.1016/j.avsg.2007.07.002. PMID 17823046. 1 2 3 4 5 "Chronic Venous Insufficiency". hopkinsmedicine.org.